The recently widowed Beth faces her first Christmas without Gordon but with her son and sister-in-law for support, what can go wrong? Her son arrives with his volatile girlfriend, her sister-in-law has developed a liking for the bottle and the recently widowed vicar, who unwittingly summons the ghost of Gordon. 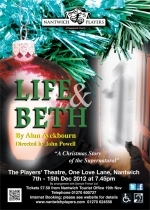 Will Beth welcome his return and why did Wagstaff - the cat - disappear the day Gordon died?